In September of 2013, a similar incident occurred when a crane broke loose and nearly hit a residential dock. 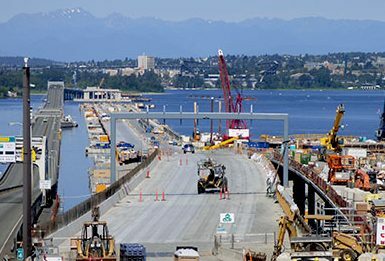 Contractors and WSDOT promised to set stronger pilings in an effort to pin the cranes to the silt bed of Lake Washington. In some places, this silt is up to 200 feet deep. Lake Washington is a deep and narrow glacial trough that was sculpted by the Vashon ice sheet, the last continental glacier to move through the Seattle area from about 19,000 – 16,000 BP (before present). Heavy winds on Wednesday apparently dislodged the crane by wiggling a piling, breaking it loose near a ledge where the lake slopes and creates a steep drop off. The floating cranes are being used to build new fixed spans near Foster Island which will replace the old 1963 bridge decks. According to Durante, Flatiron West, the contractor working on the $200 million phase of this $4.6 billion megaproject, is reassessing their backup plan to restrain equipment should underwater connections fail. In a new contract that begins next year, another set of fixed spans will be built alongside the current Highway 520 bridge.